"A good overview of fiction elements. 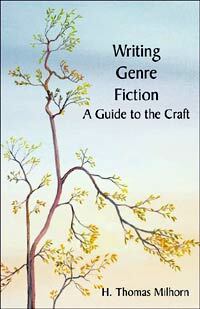 Should be easy to read for beginners and holds a few new details for more experienced writers"
"WRITING GENRE FICTION: A GUIDE TO THE CRAFT is one of the most complete guides on writing out there. I've written a number of short stories and taken several writing classes. None of them have delved into infusing your characters with emotion or covered dialogue as extensively. This guide on writing makes a great addition to my reference library." In an interview by Richard Mabry, best selling author Michael Palmer recommended Writing Genre Fiction: A Guide to the Craft for non-physicians wishing to write a medical thriller. Several years ago, after many years of writing nonfiction, I decided to write a novel—a medical thriller in the mold of Robin Cook, Michael Crichton, and Michael Palmer. The problem was that, although I knew how to write and had received a number of awards for nonfiction works, I didn’t know how to write fiction. So, before putting fingers to keyboard I did a thorough search of the literature, which included reading numerous books and hundreds of website articles. What I discovered was that there simply wasn’t one good source from which to learn the craft of writing fiction. My research culminated in the publishing of my first novel, Caduceus Awry, which was a finalist in the Eudora Welty Film and Fiction Festival novel writing contest. Writing Genre Fiction: A Guide to the Craft is the book I was looking for when I set out on my quest to learn how to write genre fiction. It is an attempt to share what I learned from my research. It covers the six key elements of genre fiction; the various genres and subgenres; a large number of genre-fiction writing techniques; plot, subplots, and parallel plots; structure; scene and sequel; characterization; dialogue; emotions; and body language. It also covers additional information about copyrighting and plagiarism, where to get ideas, manuscript formatting and revising, and query letters and synopses, In addition, an appendix covers a large number of grammar tips. - One Word or Two?